Enjoy all the benefits of a lush green landscape without dealing with the high costs and excessive maintenance associated with natural grass. Our products look like grass, feel like grass, and stay green for years. We stand behind our products which are made with the most advanced synthetic fibers and components. All of our artificial grass products are backed by a 15-year manufacturer warranty that ensures longevity and peace of mind. Artificial grass is considered the best low-maintenance alternative to a natural grass landscape. Stop worrying about unsightly holes, brown spots, mud, or dead grass with our state-of-the-art synthetic turf. Five Star Turf offers flexible leasing and financing options on our artificial grass products and installation services. 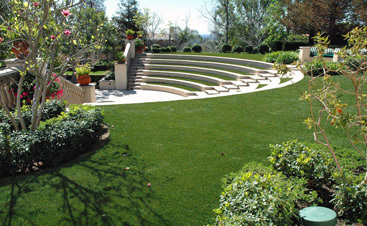 Now more than ever is it easier to transform your landscape with high-quality synthetic grass! Five Star Turf is the nation’s leading installer of artificial grass, providing alternative landscaping solutions specifically for the hospitality industry. 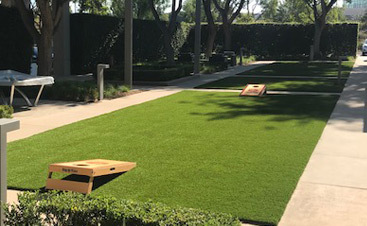 More hotels, resorts, and spas across the nation are adopting our eco-friendly synthetic turf products because they look and feel like natural grass, without requiring the time and money to maintain a lawn. Five Star Turf installs a variety of products that feature the most advanced synthetic yarns and fibers, offering durable surfaces that withstand heavy foot traffic. Five Star Turf is America’s leading commercial installer of artificial grass, specializing in landscape solutions for the hospitality industry. 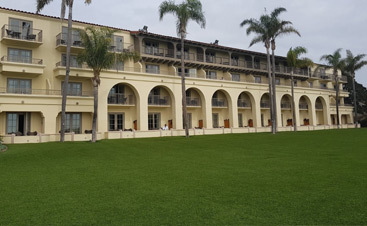 For the past five years we have installed durable, high-quality, realistic synthetic grass for businesses, hotels, resorts, and spas — saving our clients plenty of maintenance time and money for an unbeatable return on investment.